Complete Yamola kit with Wiseco piston kit, nikasil lined alloy cylinder, intake manifold, reed valve assembly, gaskets, and all necessary hardware. After the early failures of the GOL brand Imola pistons, we began experimenting and we came up with a solution using a Wiseco brand Yamaha piston and a Yamaha rod kit (sold separately, catalog #221.RD125). 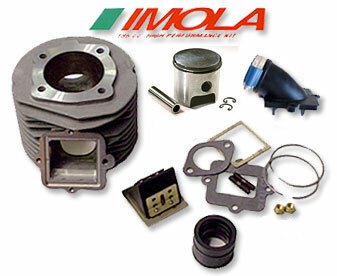 Though the new Asso brand Imola pistons have proven very satisfactory, we still offer these top quality parts for an unbeatable combination which will give many thousands of miles of trouble free high performance scootering.